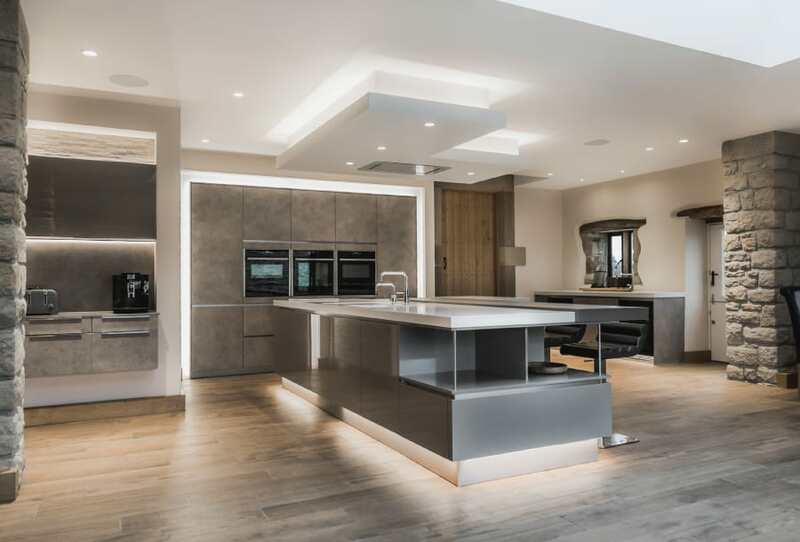 Kitchen Design Centre are honoured to have been instrumental in the development of Glenn and Jane Dunleavey’s barn conversion, writes Susan Osborne. 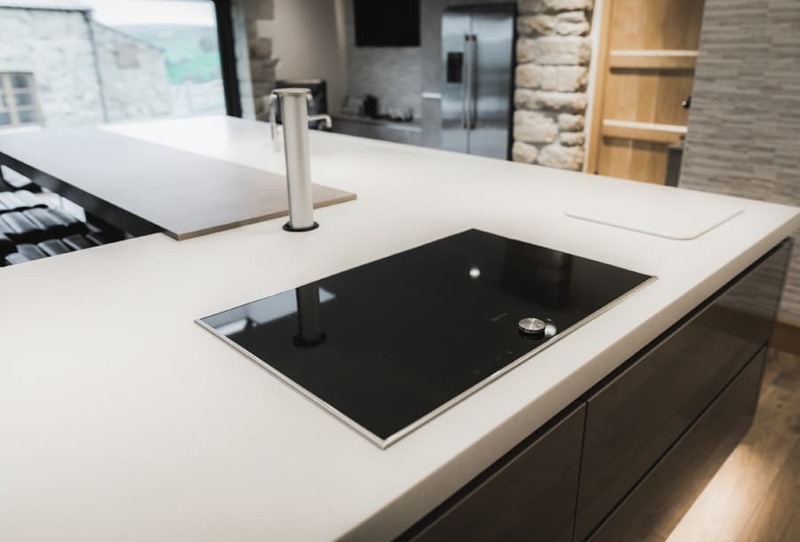 Several years ago, Glenn and Jane Dunleavey were very pleased with their original KDC kitchen, and contacted designer Simon Thomas once they were ready to go ahead with plans to convert the huge 16th century barn adjoining their farmhouse. Simon’s brief was to design a family area with living and dining space, a media area and a high-spec, functional family kitchen, with focus via enormous picture windows, to be drawn to the spectacular views down the valley. 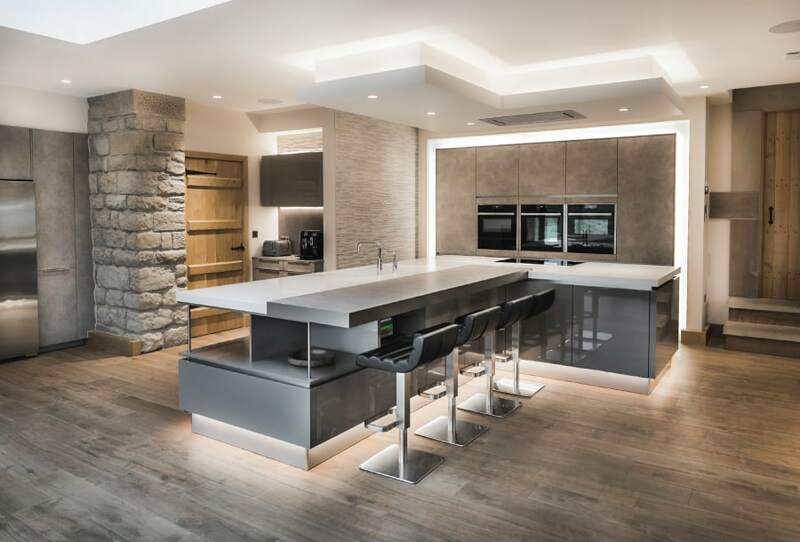 Glenn particularly wanted a very modern kitchen, clutter-free with lots of storage and concealed lighting but at the same time, it needed to be in keeping with the sympathetic barn conversion which used reclaimed stone and kept a ‘chunky’ rustic look. The space had to be functional for the family’s daily needs and hospitable for entertaining. For Simon, this was a very open brief giving him a lot of creative freedom. 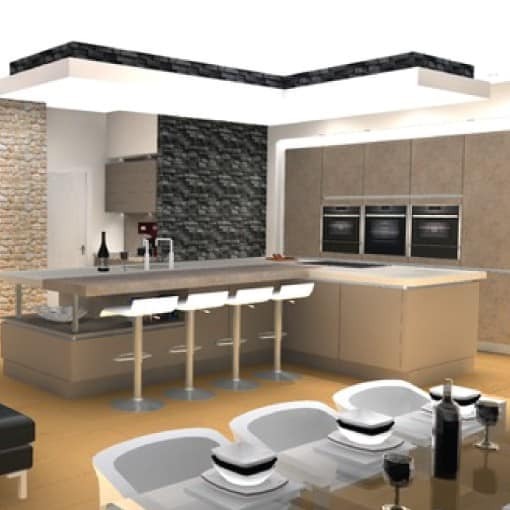 Simon collaborated with Jane and Glenn on the appliances and colour scheme. 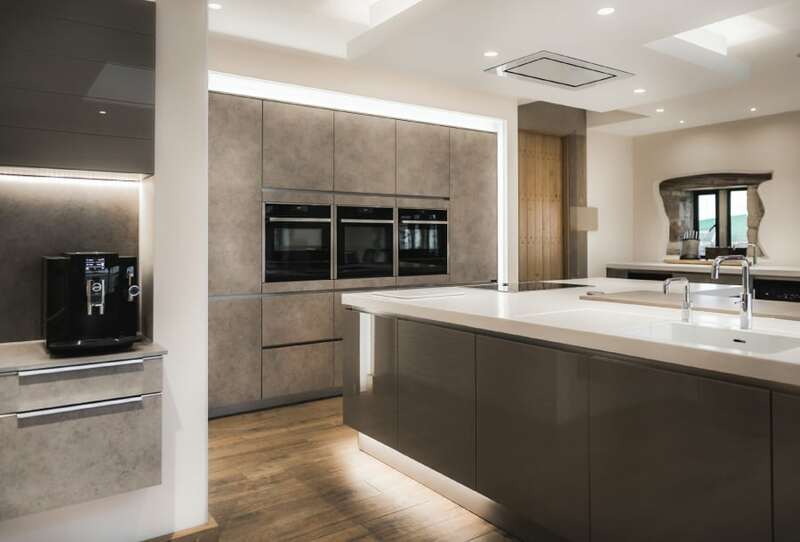 They choose top of the range Neff appliances, including Slide and Hide Pyrolitic ovens, Corian worktops for smooth seamless design and hygienic properties, Quooker taps for both sinks, and Häcker Systemat units in Salento Grey Beige. “I wanted a concretey/grey feel to contrast and compliment the stone we’ve got, which is a yellow kind of sandstone. It had to look modern but neutral,” says Glenn. Simon’s finished design is a fusion between old barn conversion and the current trend in industrial feel; a state of the art rustic/industrial look which blends harmoniously with the natural oak and stone of the barn. The lines are clean and geometrical, making good use of the ample space and light using natural tones and ultra-modern materials and appliances. 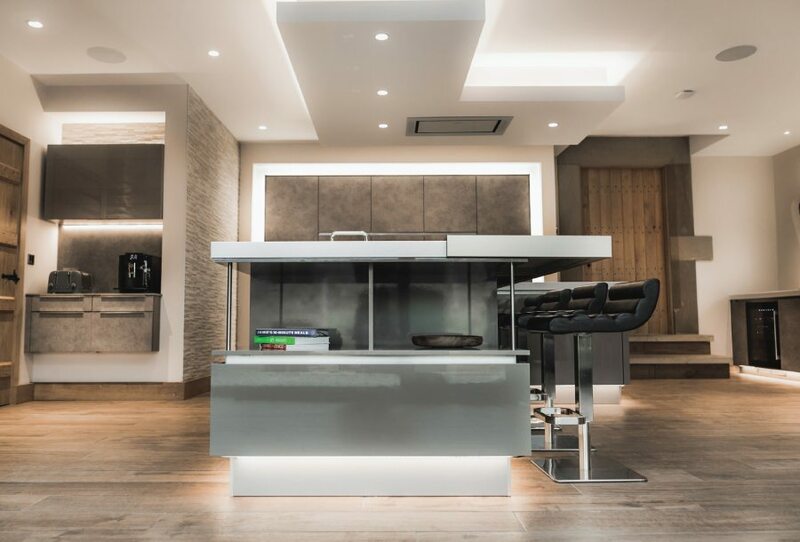 The cool white Corian seamless work surface subtly reflects natural light from a glazed architectural feature rooflight and the wide sliding patio doors leading to an open courtyard. 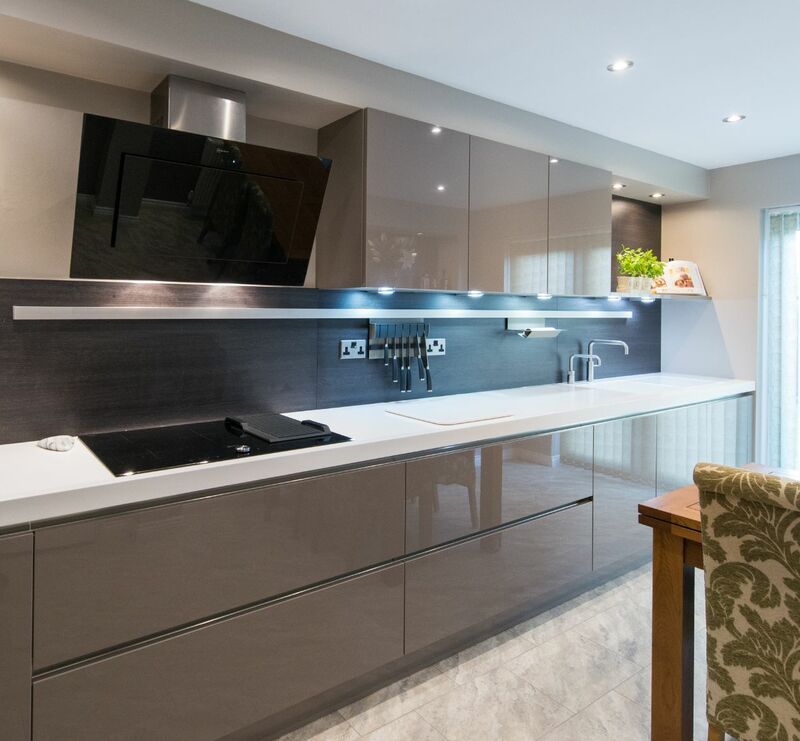 Salento Grey Beige units with slab styled doors and handleless trim maintain the smooth clean-cut look, broken only by design features and fitted appliances. 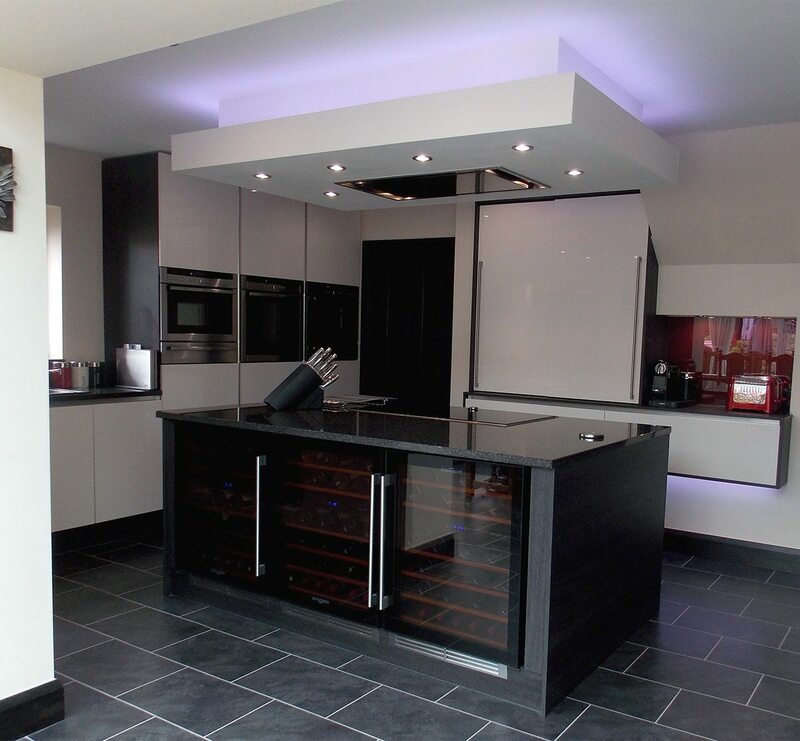 Simon designed the kitchen with two sink areas; the centre island houses the general purpose sink for cooking and food preparation, and a second sink area to the side serves as a drinks area with built under fridge and wine fridge. 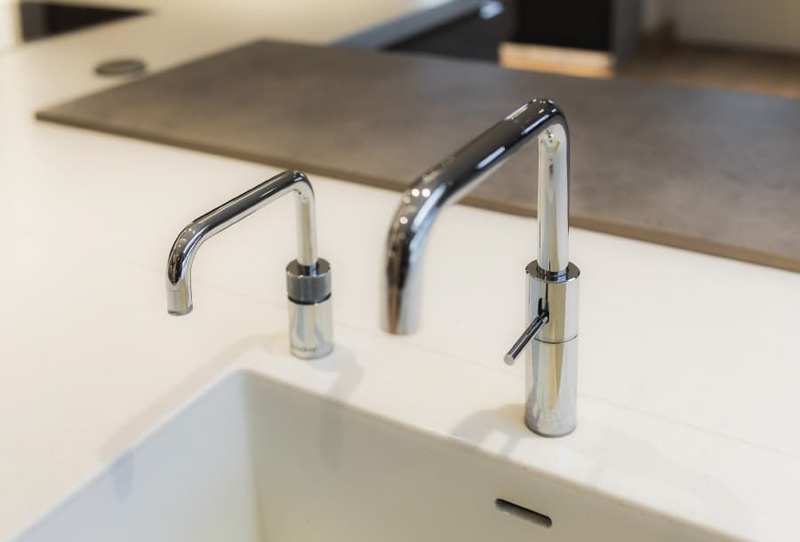 Both sinks have top of the range Quooker taps which can dispense water at true 100 degrees. A coffee station has been created in a corner alcove, complete with espresso cup storage neatly housed in a Häcker sensor operated climber lift up unit, a design which keeps everything looking neat and compliments the simplistic feel of the rest of the kitchen. 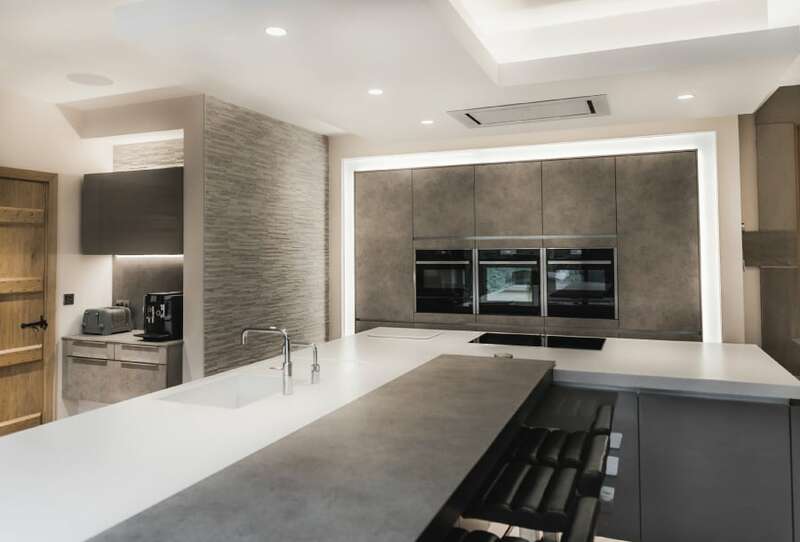 KDC experts fitted the kitchen and Glenn and Jane were very impressed by the team’s patience and flexibility when the building element of the project ran late and delayed fitting. “Craig, (KDC fitter) is an absolute genius. 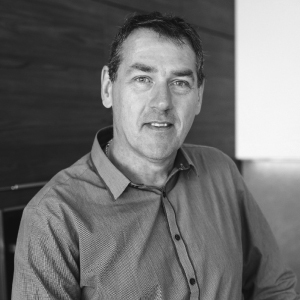 He’s really precise.” Glenn Dunleavey is known for his attention to detail so this is indeed a compliment! 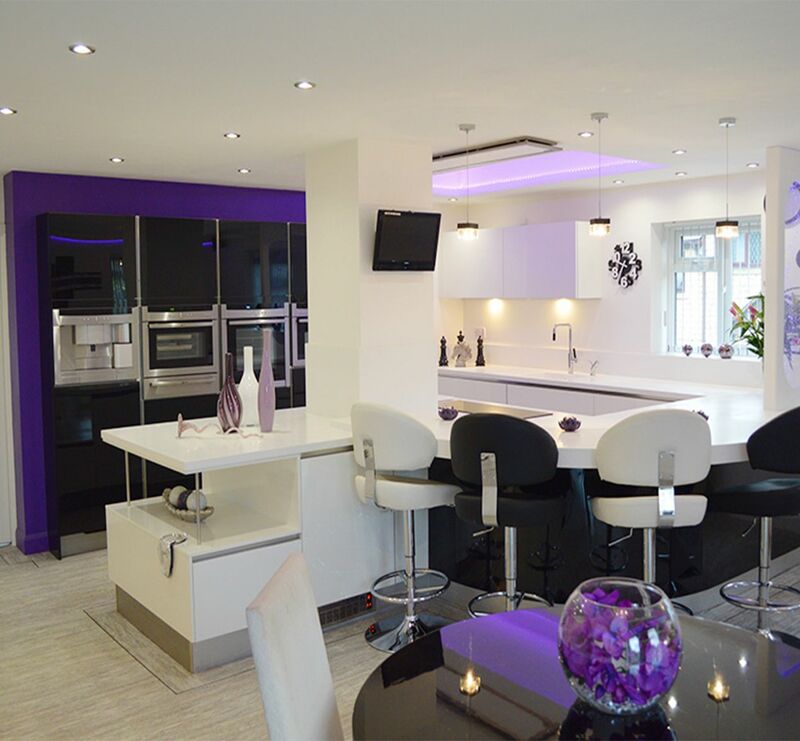 Glenn and Jane are particularly pleased with the overall look of the colour scheme and the contrasting finishes on the units and cupboards. 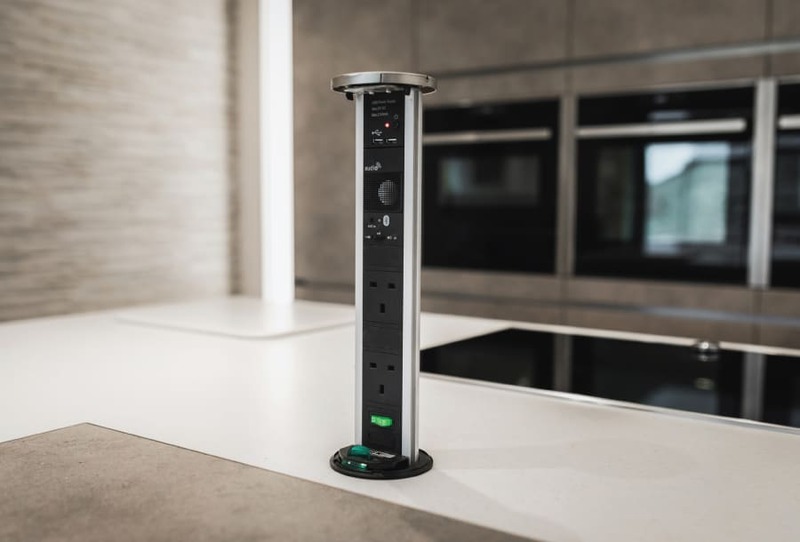 They are also really pleased with a couple of very useful small extra features that Simon incorporated into the design; a telescopic charging point for phones and tablets which sits neatly under the breakfast bar, and a power matt, subtly built under the Corian surface in the drinks area for very convenient wire-free phone charging. "I wanted a concretey/grey feel to contrast and compliment the stone we’ve got, which is a yellow kind of sandstone. It had to look modern but neutral." 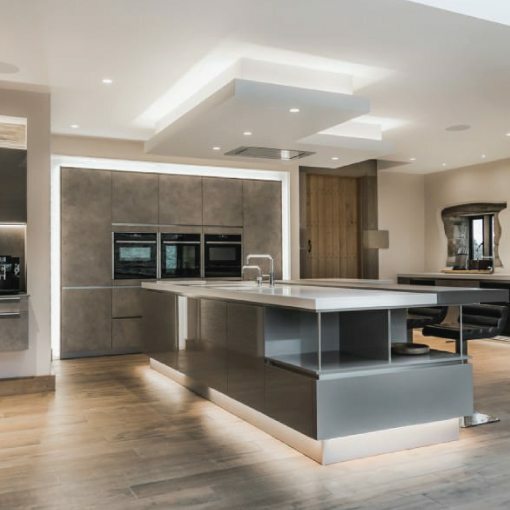 "My brief was to design a family area with living and dining space, a media area and a high-spec, functional family kitchen, with focus via enormous picture windows, to be drawn to the spectacular views down the valley. 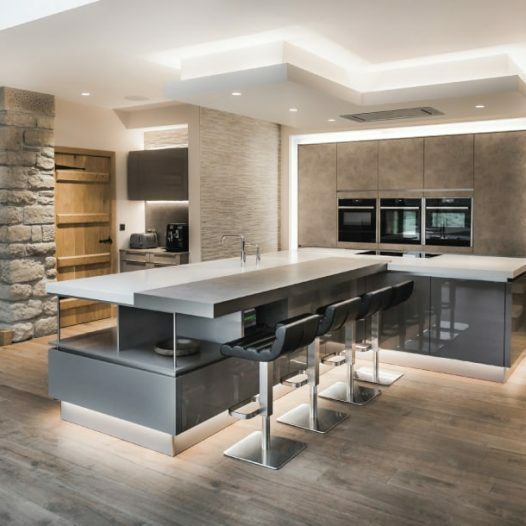 Glenn particularly wanted a very modern kitchen, clutter-free with lots of storage and concealed lighting but at the same time, it needed to be in keeping with the sympathetic barn conversion which used reclaimed stone and kept a ‘chunky’ rustic look. The space had to be functional for the family’s daily needs and hospitable for entertaining."